In this image of Atlantis, taken by the ISS Expedition 5 crew in 2002, the round, dish-shaped Ku-band antenna is easily visible deployed from its payload bay location on the lower right. Engineers are now discussing whether to replace the four bolts mating the antenna to Atlantis before its planned Aug. 27, 2006 launch. 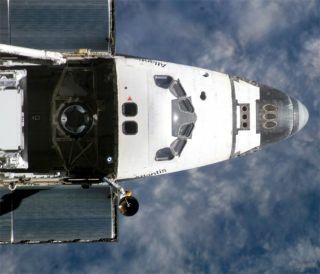 NASA officialshave opted to replace two bolts securing avital antenna to the cargo bay aboard the shuttle Atlantis, though theswap should not impact the vehicle's plannedAug. 27 launch date. "We'll begetting set up this afternoon and this evening," NASA spokesperson Tracy Young,at the agency's Kennedy Space Center (KSC) launch site, told SPACE.com. "Theoperation should be done by Sunday." Atlantisremains on track to launch toward the International SpaceStation (ISS) at 4:30 p.m. EDT (2030 GMT) on Aug. 27. The shuttle's STS-115astronaut crew is poised to deliver two girder-like trusssegments and a new set of solar arrays to the orbital laboratory duringtheir 11-dayspaceflight. While allfour of Atlantis' Ku-band antenna bolts have performed as expected throughoutthe orbiter's 26-launch history, engineers chose to replace them rather thanrisk a failure during liftoff that could send the antenna plunging down thelength of the orbiter's 60-foot (18-meter) cargo bay. "It wouldgo down and the damage would not be good," NASA shuttle program chief WayneHale Wednesday of the potential harm a loose antenna could cause. During thisweekend's bolt swap, pad technicians will remove the two aft-most bolts matingAtlantis' three-foot (almost one-meter) Ku-band antenna dish to the forwardright wall of the spacecraft's cargo bay. Those two - of four total bolts - aretoo short, with only a few treads biting into their corresponding nuts. Earlierthis week, Hale said that between six and eight engaged bolt treads are preferredfor each bolt to ensure they will hold Atlantis' 304-pound (137 kilogram)Ku-band antenna assembly fast during the eight and a half minute climb into orbit.Inspections found that only two of Atlantis' four antenna bolts were suitablysecured, though a survey of all three NASA shuttles found that some wereattached by as little as two-thirds of a tread, he added. Similartoo-short bolts have been replaced on the Ku-band antenna assemblies aboard theDiscovery and Endeavour orbiters, both of which sit in their maintenancehangars at KSC. Atlantis,however, sits in launch position at KSC's Pad 39B complex. To replace thebolts, technicians will work from theRotating Service Structure (RSS), which covers the orbiter's payload bay andprotects the spacecraft while at the launch pad. Shuttleworkers will extend a retractable platform into the top of Atlantis' cargo bayjust between the orbiter's airlock and forward end of its ISS truss and solar arraypayload. From there, pad workers will set up scaffolding to reach the antennaassembly and likely carry out the actual replacement this weekend, NASA officialssaid. The boltswap is one of two outlying issues engineers are working through for Atlantis'launch. The other is a heater thermostat glitch found in one of three auxiliarypower units (APUs) aboard the Discovery orbiter, which engineers are studyingto make sure a similar problem does not afflict Atlantis. NASA hopesto launch Atlantis duringa window that opens on Aug. 27 and closes Sept. 7.